Oh boy, do I have some catching up to do! It has been one of those weekends where I was constantly busy, but not sure exactly what I was busy doing. While I still have 44 more days to go, I have to say that the last week has been pretty painless. With preparation and keeping my mind busy on other things, time is flying. Let's see if I am still singing this tune in about 20 days. 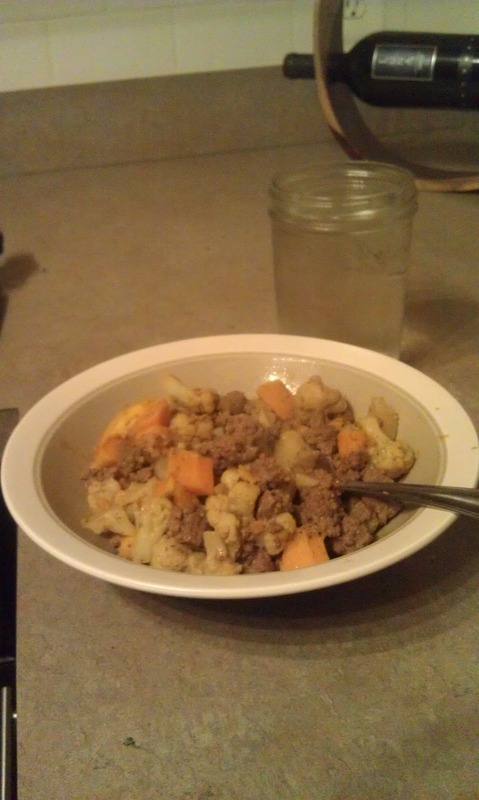 I plan to do another post on Week 2, but for now, here are the meals for the last 3 days. It doesn't look pretty, but it is pretty darn tasty. Eggs scrambled with mushrooms, spinach, bacon and salsa. 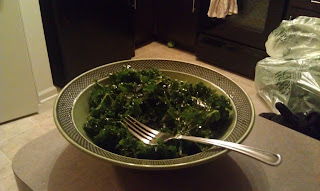 This picture doesn't do the bowl size justice, but this is a very LARGE bowl of kale dressed with lemon, olive oil and coconut aminos. Apple with almond butter for morning snack and banana after dinner. 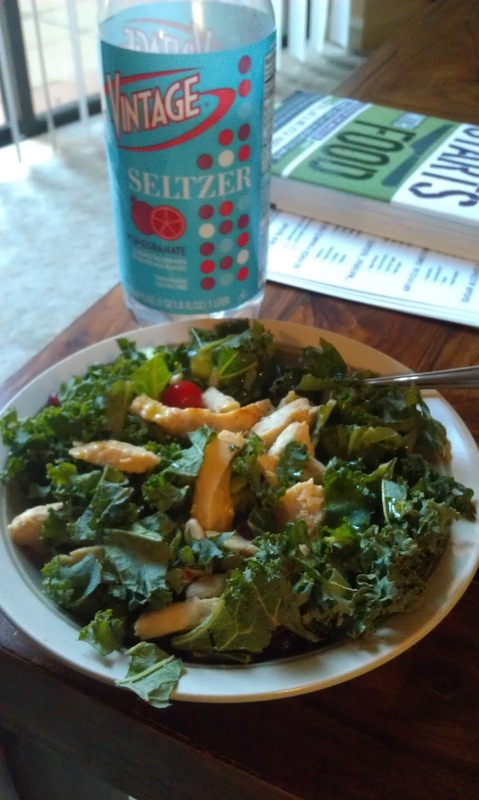 I didn't work out until 9:30, so needed a pre-work out snack. 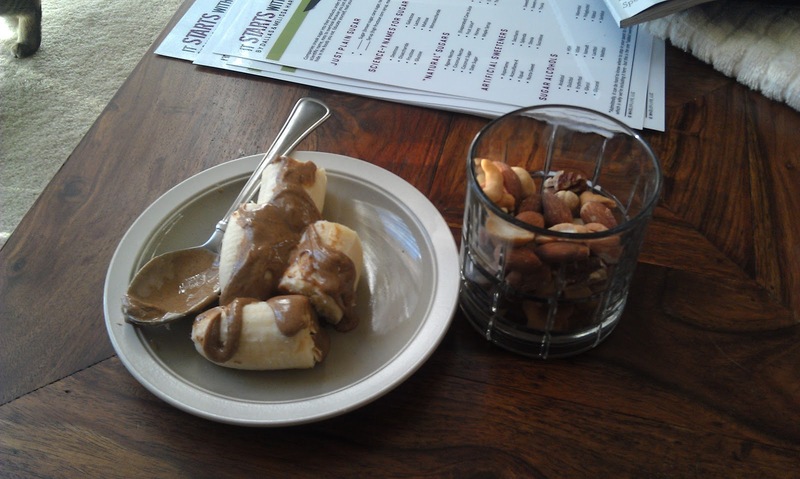 A banana with almond butter and side of mixed nuts. 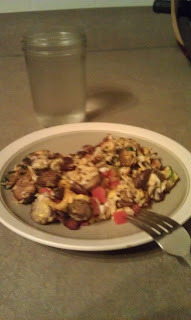 And again, a mess of scrambled eggs, with bacon, mushrooms, spinach, and salsa. 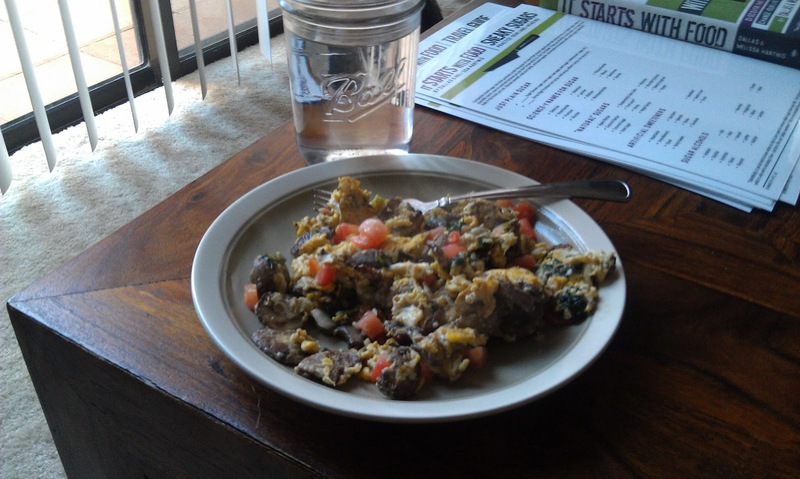 Lots of protein goodness! Kale salad with chicken, almonds, dried cranberries, and cherry tomatoes dressed with olive oil. And my new obsession: raspberry flavored seltzer water. 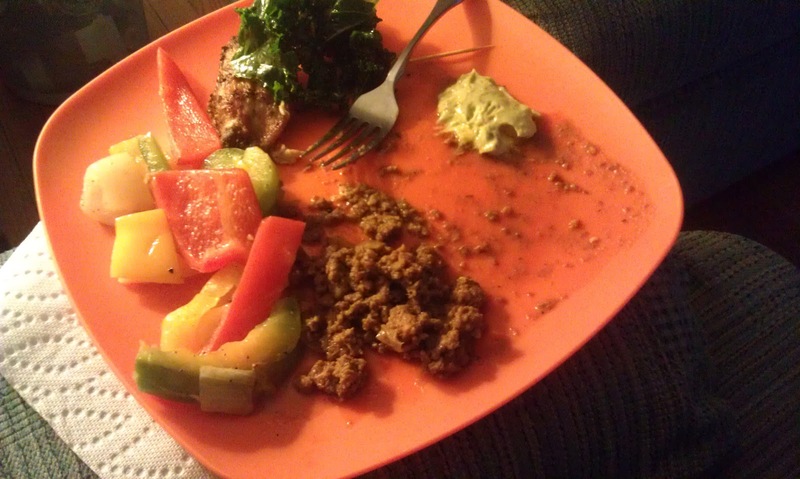 Whole30 potluck!! Woohoo! A few of the nutrition program participants got together to watch some hockey and eat some compliant food. Such a great idea! I took this picture about half way through my meal, so please excuse the mess. This plate did have some roasted chicken wings, a spicy ground beef, sautéed bell peppers and onions, a crab meat stuffed mushroom, and garlic kale salad. Not pictured are the seconds I helped myself to! 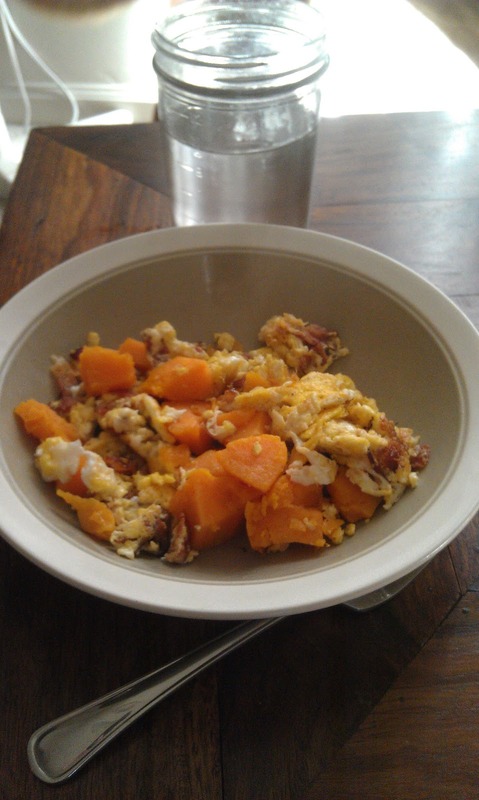 Bringing back an old favorite: bacon, eggs, and sweet potatoes. The perfect warm breakfast after a cool, winter morning run! 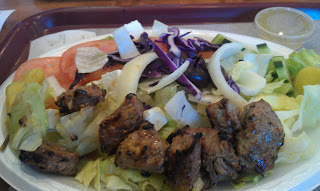 This is a bad picture, but the food was delicious! This was some ground beef cooked in coconut milk, cauliflower, and sweet potatoes sprinkled with lots of curry powder. 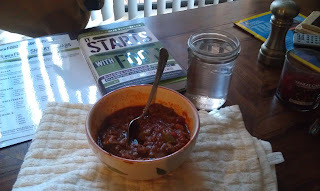 This was a bowl of comfort! So good! I had two bowls before taking off for a cocktail party which was excellent planning on my part. No temptation to sneak a bite of all the fried appetizers floating around.